This paper reviews ultrasound-induced inertial cavitation of phospholipid-coated microbubbles and ultrasound-induced sonoporation of phospholipid bilayers. In addition to the ultrasound wave, the common link between these two phenomena is the presence of a phospholipid membrane. Moreover, inertial cavitation of microbubbles is one putative mechanism by which sonoporation of phospholipid bilayers is believed to occur. Accordingly, a central theme of the paper is how phospholipid membrane properties influence acoustic phenomena. The paper describes, via a combination of experiment and mathematical modeling, how membrane material properties (in particular, the area expansion modulus, KA, but also curvature, surface tension, and surface dilatational viscosity) influence the inertial cavitation threshold pressure. 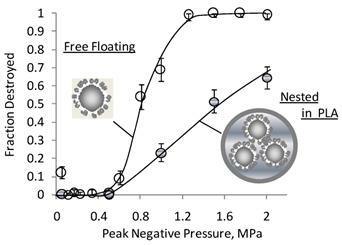 This is followed by a discussion of the influence of nesting one or more microbubbles inside the aqueous core of a polymeric microcapsule, which significantly inhibits inertial cavitation and prevents cell death when inertial cavitation does occur. Inertial cavitation is then discussed in the context of sonoporation, along with other putative mechanisms believed to account for ultrasound-induced pore formation in phospholipid bilayers. This is followed by a description of how the kinetics of sonoporation correlate with bilayer phase behavior, suggesting the possibility that sonoporation can be used to control the rate of drug release from phospholipid vesicles. The phrase “reverse sonoporation” is used to describe ultrasound-induced release of drug from a liposome and to distinguish this from traditional sonoporation, in which microbubbles are used to deliver cargo into a cell. Reverse sonoporation gives one the ability to control when, where, and how fast drug is released. Taken together, nesting of microbubbles inside phospholipid vesicles constitutes a “theranostic” vehicle that can be used for both long-lasting, safe imaging and for controlled drug delivery. What is needed now is a fundamental understanding of what sets the inertial cavitation threshold of lipid-coated microbubbles. Such information requires systematic investigations in which the lipid coating material properties are carefully controlled by changes in chemical composition, but such systematic studies are lacking. We recently performed a preliminary study of inertial cavitation of non-commercial, lipid-coated microbubbles. We build on those preliminary investigations herein. The value of γ, the polytropic index, equals unity for isothermal processes (no heat flow restrictions) and equals the ratio of the heat capacity of the gas at constant pressure to that at constant volume for adiabatic processes (no heat transfer). Neither extreme is likely to hold during insonation, and the value of γ might not be constant during a single ultrasound cycle or upon inertial cavitation. Taking the RPNNP equation as a starting point, numerous efforts have been made to account for the influence of a coating at the gas/liquid interface. For example, de Jong et al. in 1992 introduced a shell parameter, Sshell, which they related to a bulk property, namely Young's modulus (E). de Jong and Hoff followed this a year later by replacing Sshell with a new elasticity parameter, SP, and adding a new term, Sf, which they named the “shell friction.” Three years later Hoff and Hoff described a new approach, implementing the Kelvin-Voigt model for viscoelastic solids to describe the coating in terms of the bulk modulus, K, and the volume viscosity, μK. Frinking and de Jong revisited the problem in 1998, invoking a new friction parameter, SF, to describe the viscosity of the shell and a new elasticity parameter, Keff. A different approach was taken by Doinikov and Dayton, who used the Lagrangian equations to solve the bubble energy balance, including dissipation effects. Doinikov and Dayton's solution is equivalent to that of de Jong and Hoff with Sp being proportional to the product of coating thickness and bulk modulus and with Sf being proportional to the product of coating thickness and bulk viscosity. Another approach that takes into account the presence of a coating is that of Church. where c is the speed of sound in water and is the time derivative of the pressure just outside the bubble. As is the case for developers of the RPNNP equation, Herring did not address the influence of a coating at the gas-water interface. Accordingly, attempts have been made to modify the Herring equation to describe the influence of a lipid coating on the bubble dynamics. Perhaps the most well known modification of the Herring equation is the model proposed by Morgan et al. The Morgan modification of the Herring equation, which describes the monolayer in terms of two parameters, χ and μsh, has enjoyed widespread use. Chatterjee and Sarkar took a somewhat different approach, building on rheological models that describe biological membranes and fluid interfaces with adsorbed surfactants and proteins, and wrote a Rayleigh-Plesset type equation that involves the surface dilatational viscosity, κs. The surface dilatational viscosity, which is rigorously defined for interfacial systems, [55-59] was later used by Marmottant et al., who put forth a model to account for the fact that surface tension increases with area per (surfactant) molecule. [60-63] Rather than using a single value for surface tension, Marmottant et al. treat surface tension as a discontinuous function; depending on bubble radius, they set surface tension equal to one of two different constants or make surface tension proportional to χ. In this way, the Marmottant et al. model accounts for a variety of microbubble phenomena, including buckling and rupture. As they did with modifications of the RPNNP equation, Doinikov and Dayton re-worked the Herring equation to include coating effects and present a solution that is equivalent to the Marmottant et al. model with χ being proportional to the product of coating thickness and bulk modulus and κs being proportional to the product of coating thickness and bulk viscosity. The foregoing discussion is not exhaustive, and a review of the topic is available. Noteworthy among the works involving bubble coatings is the work of Glazman, who describes adsorption of surface-active agents in the context of the Gibbs adsorption isotherm and relates elastic properties to changes in surface tension that arise from changes in surface concentration of adsorbed molecules. Also noteworthy is the work of Sarkar et al., who first consider the influence of a constant surface dilatational elasticity  and later compare the constant elasticity model with two varying elasticity models. where G is the Gibbs free energy, ns is the number of surfactant molecules in the monolayer, and A is the area of the monolayer. Given that surface tension is the first derivative of Gibbs free energy with respect to area, KA is a membrane property that describes how surface tension varies with area. Prior models involved the area expansion modulus, which goes by other names[65, 66]; the choice of the name area expansion modulus, and the symbol KA, is made here to be consistent with experimental investigations. We note that this result is equivalent to an expression that accounts for the influence of dilatational surface elasticity, ES, in a viscoelastic interfacial rheological model derived previously by Sarkar et al. By returning to the original Herring equation and following the approach of Marmottant et al., by expressing the influence of area expansion modulus via eqn (7), and by invoking the result of Chatterjee and Sarkar to capture the influence of surface dilatational viscosity, one arrives at a bubble physics model written in terms of KA. Eqn (iii) describes the model in words, and eqn (8) is the mathematical result obtained by solving the energy balance. Eqn (8) describes the influence of a coating using three membrane properties, each of which can be measured. Accordingly, eqn (8) could potentially be used to make predictions about microbubble behavior, which would be useful if the dependence of the material properties on microbubble composition were known (and bearing in mind that KA values measured under quasi-static conditions might not necessarily be applicable to the transient conditions that arise upon application of ultrasound). For example, the way in which KA varies with poly(ethylene glycol) PEG molecular weight and mole fraction is well described. [69-72] This information could potentially be used to design microbubbles in a rational way with eqn (8), simply by changing the molecular weight or amount, or both, of PEG in the microbubble lipid coating to achieve a desired value of KA. In particular, PEG displays two different concentration regimes, each with different physical characteristics, known as the “mushroom” and the “brush.”[73-75] The mushroom and brush regimes, which are set by the local PEG mole fraction, exhibit markedly different dependencies of PEG chain density on PEG mole fraction and molecular weight; as a result, the two PEG regimes exhibit markedly different dependencies of area expansion modulus on PEG mole fraction and PEG molecular weight. where Xo is the concentration of PEG chains in the mixture, Eads is the adsorption energy per polymer chain (normalized by kT) and N is the number of freely rotating polymer segments; for PEG the molecular weight (MW) of a segment is 44 g/mol such that N = MW/44. Using the definition of KA in eqn (6) and recognizing that in the case of a dilute mushroom layer the energy of the polymer is independent of chain density it becomes clear that KA is independent of PEG molecular weight and composition in the mushroom regime and thus equals KA,o, the area expansion modulus of the lipid monolayer in the absence of PEG, eqn (10a). In the brush regime, on the other hand, chains overlap such that one obtains eqn (10b). Thus, KA increases in the brush regime as one increases PEG mole fraction, which might seem obvious. Perhaps counter-intuitively, KA decreases with PEG molecular weight. It is quite conceivable that an increase in PEG molecular weight would make the monolayer stiffer - for a given mole fraction of PEG within the monolayer. However, an increase in molecular weight makes incorporation of PEG into the monolayer more difficult such that the net effect is a predicted decrease in KA with increasing (inverse 3/5 power of) PEG molecular weight for a given overall mole fraction of PEG within the system. Figure 1 summarizes these ideas. Inertial Cavitation of Lipid-Coated Microbubbles: Ultrasound causes lipid-coated microbubbles to expand and contract. If the pressure is below a critical value, called the inertial cavitation threshold, then the bubble undergoes sustained oscillations (A). If the pressure is above the inertial cavitation threshold, then inertial forces govern the collapse; this is typically associated with the bubble imploding and breaking into small fragments (B). The inertial cavitation threshold pressure depends on the material properties of the lipid coating (e.g., area expansion modulus and surface tension), which are set by the monolayer composition (lipid chain length and PEG mol. wt. & regime - brush vs. mushroom), and on the presence of a PLA microcapsule and distance to the PLA wall (C). While certainly a significant step forward, writing a bubble physics model in terms of KA is not the end of the story. This is because of the inherent inability of any bubble model, regardless of its accuracy, to predict inertial cavitation. The bubble models merely describe the magnitude of the microbubble oscillations as a function of time; no single criterion has been established that identifies, unequivocally, when a microbubble will undergo inertial cavitation. Indirect attempts have been made by defining a critically expanded radius in terms of the resting radius. For clean bubbles, cavitation has been said to occur when the bubble expands to twice the resting radius. Others claim cavitation does not occur unless or until the bubble expands to 2.3 times the resting radius. The origin of relative expansion as a criterion for inertial cavitation stems from Flynn's decomposition of the bubble acceleration into two terms, an inertial function (IF) and pressure function (PF), and the identification of the ratio of the maximal bubble radius to the resting radius at which the IF intersects the PF as the critical normalized maximal radius, (Rmax/Ro)c. Strictly speaking, inertial cavitation occurs when inertial forces control the collapse, and this occurs when (Rmax/Ro) exceeds (Rmax/Ro)c; practically speaking, this occurs when R/Ro ranges from 2 - 3 for clean bubbles and higher values for coated bubbles. [34, 78, 80] O'Brien et al. find that the amount of expansion required for inertial cavitation of commercial contrast agents varies from 3.4 to 8.0 times the resting radius. Figure 2 shows the prediction methodology and the influence of the inertial cavitation criterion. First, eqn (8) is used to calculate the dynamic bubble radius and generate a “radius-time” plot, in which the quantity (R/Ro) is given as a function of time. 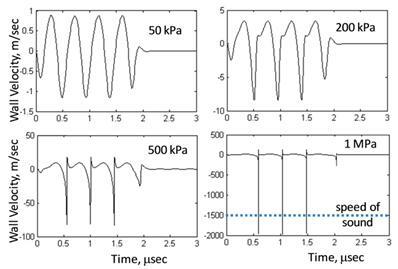 Four such radius-time plots are shown, each for a different applied ultrasound pressure (50, 200, 500, and 1000 kPa) and for an initial resting radius of 1 micrometer; the greater the pressure, the greater the magnitude of the oscillations. Next, the radius-time plots are analyzed against a criterion for inertial cavitation so as to determine whether inertial cavitation has occurred. If the microbubble populations were monodisperse, then this would be the end of the analysis; one would simply find the pressure at which inertial cavitation occurs. Predicted Cavitation Destruction Profiles: We use eqn (8) to predict the magnitude of microbubble oscillations as a function of time for a specified value of the area expansion modulus, KA (as well as other material properties) and for a specified ultrasound pressure (KA = 50 mN/m, σ = 51 mN/m, and κs = 7 x 10 -6 sP) . The result is a “radius-time” plot, in which the ratio of radius to resting radius (R/Ro) is plotted versus insonification time. Four radius-time plots are shown for four different ultrasound peak negative pressures (0.05, 0.2, 0.5, and 1.0 MPa), each exhibiting a different maximal value of R/Ro (~1.1, 1.4, 2.3, and 4.1, respectively). Such information can be used to predict cavitation destruction profiles if one specifies a critical value, (R/Ro)*, at which cavitation occurs; that is, cavitation is predicted to occur only when the maximal value of (R/Ro) in the radius time plot exceeds (R/Ro)*. For example, if (R/Ro)* is 2, then cavitation is not predicted to occur at 50 kPa or 200 kPa but is predicted to occur at 500 kPa and 1 MPa. If (R/Ro)* is 3 or 4 (or strictly speaking, anywhere in the range 2.5 - 4.1 as (R/Ro)* need not be a whole number), then cavitation is predicted to occur at 1 MPa but not at the lower pressures. If (R/Ro)* is greater than 4.1, then cavitation is not predicted to occur at any of the four pressures shown; cavitation would require a pressure greater than 1 MPa. Generating radius-time plots for a large number of pressures leads to the predicted cavitation destruction profiles shown in the rightmost panel. Predictions are shown for (R/Ro)* values in the range 2 - 8. Given that the ultrasound frequency is fixed (here, 2.25 MHz), a single (R/Ro)* value will translate to different microbubble wall velocities for different resting radii (Ro). It is therefore unlikely that inertial cavitation can be predicted using a single value of (R/Ro)*; alternatively, one could potentially use microbubble wall velocity, rather than (R/Ro)*, as a criterion for predicting inertial cavitation (see Fig. 3). Microbubble Wall Velocity: Eqn (8) is used to plot microbubble wall velocity, rather than radius (as was done in Fig. 2), versus time. Conditions are the same as in Figure 2 (material properties are fixed: KA = 50 mN/m, σ = 51 mN/m, and κs = 7 x 10-6 sP at four different pressures: 50, 200, 500, and 1000 kPa). Analogous to a critical bubble expansion, (R/Ro)*, one could define a critical microbubble wall velocity relative to the speed of sound *, as a predictor of inertial cavitation. Note that the microbubble wall velocity exceeds the speed of sound only at a pressure of 1 MPa. If the criterion for cavitation were * = 1, then cavitation would occur at 1 MPa but not at the lower pressures. A highlight of Figure 2 is that the predicted inertial cavitation profile is highly sensitive to the criterion used for cavitation. That is, if the criterion for inertial cavitation is based on a critical bubble expansion, (R/Ro)*, such that no inertial cavitation occurs unless the maximal value of (R/Ro), as calculated by eqn (8), exceeds (R/Ro)*, then the predicted inertial cavitation profile depends heavily on the chosen value of (R/Ro)*. For example, if (R/Ro)* is 3, then inertial cavitation is not predicted to occur at 500 kPa whereas if (R/Ro)* is just 2, then inertial cavitation is predicted to occur at 500 kPa. The sensitivity to (R/Ro)* values in the range 2 - 8 is shown. As an alternative to (R/Ro)*, one might consider using the microbubble wall velocity - perhaps relative to the speed of sound - as a criterion for inertial cavitation. Figure 3 shows microbubble wall velocity, as calculated from eqn (8), for the same conditions as in Figure 2. Supposing the criterion for inertial cavitation were that the microbubble wall velocity must exceed the speed of sound, then inertial cavitation would be predicted to occur at 1 MPa but not at the lower pressures. In addition to the sensitivity to the criterion used to identify inertial cavitation, it is natural to ask what is the sensitivity of inertial cavitation to the monolayer material properties contained within eqn (8)? Figure 4a shows predicted inertial cavitation profiles for a range of experimentally relevant KA values; by comparison, the effects of surface tension (Fig. 4b) and surface dilatational viscosity (Fig. 4c) on inertial cavitation are small. Comparison of Figure 4 with Figure 2 further reveals how significantly (R/Ro)* influences the prediction of inertial cavitation. The method for measuring cavitation is conceptually straightforward. A microbubble is examined within the focal overlap region of two, focused ultrasound transducers. One transducer excites the microbubble with successive pulses of ultrasound at a given pressure, and a second transducer (oriented 90° relative to the first) detects the acoustic activity of the microbubble. The region of focal overlap is sufficiently small (and the microbubble concentration sufficiently dilute) that only a single microbubble is present yet sufficiently large that the microbubble cannot diffuse away on the time scale of the experiment. Comparison of acoustic activity from pulse to pulse at multiple excitation pressures permits obvious identification of the inertial cavitation threshold pressure as that pressure at which the microbubble vanishes and broadband noise arises. One key aspect of the methodology worth noting here is the fact that a given bubble formulation does not exhibit a single inertial cavitation threshold pressure but rather a range of pressures commensurate with the polydispersity of the formulation. Experimentally, hundreds of microbubbles from the same microbubble formulation are sampled at each pressure in a range of applied pressures, and the fraction of bubbles destroyed at each pressure is measured and recorded. The results are graphed as a so-called inertial cavitation destruction profile, which is a plot of the fraction of bubbles destroyed as a function of ultrasound peak negative pressure. The point is that the experimental methodology takes into account the effect of sample polydispersity; however, such sample polydispersity cannot be distinguished from the possibility that a given microbubble (or a monodisperse population) might display a multitude of behaviors. Figure 5 shows inertial cavitation destruction profiles from an experimental study involving sulfur hexafluoride microbubbles coated by a monolayer of DSPC with varying amounts of PEGylated DSPE of varying molecular weights and mole fractions. A few observations are noteworthy: Samples in the mushroom regime fall roughly onto a single curve (Fig. 5A), irrespective of PEG mol. wt. or mole fraction, suggesting that inertial cavitation is insensitive to changes in either PEG molecular weight or composition. This result is consistent with the prediction of eqn (10a). In the brush regime, inertial cavitation is observed to be sensitive to both PEG molecular weight and composition. Specifically, increasing the PEG mole fraction at a fixed molecular weight (Fig. 5B) increases the inertial cavitation threshold, and increasing the PEG molecular weight at a fixed PEG mole fraction (Fig. 5C) decreases the inertial cavitation threshold. These results, too, are consistent with theory according to eqn (10b). Qualitatively, the results of Figure 5 are consistent with theory in that they follow the trends one would expect from eqns (8), (10a), and (10b). Admittedly, a few data points violate the trends, and more experimental work is warranted; nevertheless, the majority of the data acquired are consistent with the theoretical framework presented above. For illustrative purposes, Figure 6 shows a direct, quantitative comparison of calculated inertial cavitation profiles (solid lines) with measured inertial cavitation profiles (symbols) for samples representative of both the mushroom (A) and brush (B) regimes. At first glance, the comparison appears to show excellent agreement between theory and experiment, but the results can be misleading. Although the calculated profiles in Figure 6 are not best fits of the data, they are also not, strictly speaking, predictions. Making a priori predictions would require known values for the surface tension, surface dilatational viscosity, and area expansion modulus. In principle, such values can be obtained from experiment, but the values are not yet known for the specific system studied here. Thus, testing the predictive power of eqn (8) must wait until the physical properties are measured for the microbubble monolayers used herein. Predicted Inertial Cavitation Profiles and Sensitivity to Membrane Properties: Predicted inertial cavitation destruction profiles are calculated using eqn (8). Sensitivity of the predictions to area expansion modulus (A), surface tension (B), and surface dilatational viscosity (C) is shown for ranges of material property values expected to be realized in practice. Except where varied as shown in a given panel, material properties were KA = 50 mN/m, σ = 51 mN/m, and κs = 7 x 10 -6 sP, and the criterion used for cavitation was (R/Ro)* = 4. Driving frequency was set at 2.25 MHz to match experiments. Influence of PEG (Regime, MW, and Mole Fraction) on Microbubble Inertial Cavitation: Measured cavitation destruction profiles are shown for mushroom (A) and brush (B and C) regimes. Within the mushroom regime, cavitation is insensitive to changes in either PEG MW or mole fraction. Within the brush regime, on the other hand, increasing the PEG mole fraction (from 5 to 10 mole% PEG at a fixed mol. wt. of 2000 g/mol) increases the cavitation threshold (B), and increasing the PEG MW (from 2000 to 5000 g/mol at a fixed composition of 10 mole% PEG) decreases the cavitation threshold (C). All samples in panels A-C comprised sulfur hexafluoride (SF6) as the gas core and DSPC as the coating phospholipid. Ultrasound driving frequency was 2.25 MHz. Lines are drawn as an aid to the eye. Adapted from . Comparison of Inertial Cavitation Predictions with Experiments: Eqn (8) was used to predict inertial cavitation profiles for two cases: (A) a mushroom regime sample and (B) a brush regime sample. Both samples comprised nominally 2 micron diameter microbubbles of sulfur hexafluoride coated by a monolayer of DSPC, for which the surface tension and dilatational viscosity were fixed at 51 mN/m and 7 x 10-6 sP (surface Poise), respectively. The mushroom sample included 1 mole% of DSPE-PEG 2000 with an estimated area expansion modulus of 25 mN/m. The brush sample was made using 10 mole% DSPE-PEG 2000, for which the area expansion modulus was calculated via eqn (10b) to be 70 mN/m. The criterion used for cavitation in both cases was (R/Ro)* = 3. In the meantime, we have estimated the values based on what is known in the literature. We set the surface tension to 51 mN/m to match prior studies,[54, 86] bearing in mind that the surface tension value has relatively minor influence on the cavitation destruction profile (per Fig. 4B). We set the surface dilatational viscosity to 7 x 10-6 sP, based on a value for octanoic acid reported by Kao et al., bearing in mind that this value varies with surfactant concentration and that reported surface dilatational viscosity values depend on the measurement method. We hold the values of the surface tension and surface dilatational viscosity fixed in the two (mushroom and brush) regimes, as the primary surfactant (DSPC) is the same in both regimes. To our knowledge, area expansion modulus has not yet been measured for DSPC-PEG monolayers coating gas bubbles. We therefore estimated the area expansion modulus of the mushroom regime sample, which contained 1 mole% of DSPE-PEG 2000, to be 25 mN/m, based on the work of Rawicz et al. involving bilayers surrounding an aqueous core. Proceeding from this value for the mushroom regime sample, we calculated a value of 70 mN/m for the area expansion modulus of the brush regime sample, which contained 10 mole% DSPE-PEG 2000, using eqn (10b) and Eads = 8.4. Finally, we set (R/Ro)* to a value of 3 and held this value fixed - as the criterion for inertial cavitation - in both regimes. Similar to a need for values of the material properties, testing the predictive capabilities of eqn (8) will require greater knowledge as to the criterion for inertial cavitation. Given these considerations, one might say the agreement between theory and experiment is reasonable yet more work needs to be done. We recently described nesting of microbubbles inside the aqueous core of microcapsules, both for long-lasting, safe imaging[44, 81] and for controlled drug delivery. A microcapsule shell can be made from a biodegradable polymer such as poly(lactic) acid (PLA) or from a (self-assembled) phospholipid bilayer (in which case the microcapsule is a phospholipid vesicle, or liposome). We find that PLA is advantageous for imaging for at least four reasons: 1) it prevents gas escape into the bulk fluid, thus slowing gas diffusion and increasing microbubble longevity; 2) it inhibits inertial cavitation, thus increasing the inertial cavitation threshold and improving safety; 3) it absorbs the energy of inertial cavitation when inertial cavitation does occur, thus inhibiting cell death and improving safety; and 4) it gives contrast-to-tissue ratios that are equally bright to commercial agents and that persist at least an order of magnitude longer. [45, 81] Naturally, there are also likely to be some disadvantages. Primary among these are the fact that PLA microcapsules are necessarily larger than the microbubbles they encapsulate. Additionally, PLA microcapsules are stiffer than phospholipid membranes. Considering the latter, we find that a phospholipid bilayer is well-suited for drug delivery because the rate of ultrasound-induced release from liposomes can be tuned using bilayer phase behavior. [43, 81, 87] In this section we consider the influence of a PLA shell on inertial cavitation; we consider the influence of a phospholipid bilayer on release kinetics in the Sonoporation section. Nesting microbubbles inside a microcapsule or vesicle is shown in Figure 7. Figure 7A shows an electron micrograph of the microcapsules, along with a cartoon representation (7B) and a fluorescent micrograph (7C) revealing the presence of microbubbles inside the aqueous core. The number of microbubbles within a microcapsule and the relative sizes of microbubbles and microcapsules are readily varied via changes in recipe and homogenization speeds. Figure 8 shows that the nested configuration significantly inhibits inertial cavitation. For example, a pressure of 1.4 MPa led to complete destruction of a population of DSPC-coated, SF6 microbubbles when those microbubbles were freely floating (that is, un-nested) but led to destruction of less than half of a population of identical microbubbles that were nested inside PLA microcapsules. The nested configuration has not been addressed in any of the foregoing bubble models, but the dramatic influence on inertial cavitation suggests that nesting microbubbles is worthy of further investigation. One possible explanation for the increase in inertial cavitation threshold pressure observed with nested formulations relates to changes in microbubble acoustic absorption and damping. Another possible explanation is that the inhibition of inertial cavitation in the nested configuration arises from surface repulsions similar to those observed when microbubbles are insonified near a stiff wall. [88-91] Specifically, we hypothesize that the PLA microcapsule resists microbubble expansion in a manner analogous to the way a stiff wall causes microbubble jetting. That is, a repulsive force arises as the microbubble wall, owing to gas expansion, approaches the microcapsule wall, and the magnitude of this force is inversely proportional to the square of the distance between the two walls; the repulsion slows the velocity of the microbubble wall, thereby inhibiting inertial cavitation. We are presently investigating various aspects of nesting, including then number and size of nested microbubbles, microbubble size polydispersity, interactions between microbubbles, and varying microcapsule shell materials, whose stiffness and toughness may vary. In particular, we are interested in nesting microbubbles inside an aqueous core surrounded by a phospholipid bilayer; not only is the bilayer deformable, which is interesting from a scientific viewpoint, but it is susceptible to sonoporation. [43, 81, 87] Accordingly, nesting of microbubbles inside the aqueous core of a liposome (or giant, uni-lamellar phospholipid vesicle) constitutes a controllable drug delivery vehicle whereby ultrasound-induced cavitation of the microbubbles within the vesicles facilitates (reverse sono)poration of the vesicle bilayer and hence release of drug from the vesicle. It is this phenomenon to which we now turn our attention. Despite the popularity of sonoporation, the detailed mechanism of sonoporation remains largely unknown. Excellent reviews of the topic are available. [19, 23, 82, 95] Briefly, some contend that the mechanism requires inertial cavitation,[25, 27, 96] while others contend that sustained microbubble oscillations - or stable cavitation - is sufficient; in the latter case, shear stresses associated with acoustic microstreaming are believed to play a key role. [16, 17, 23, 24] Still others contend that both types of cavitation are important. Figure 9 summarizes these putative sonoporation mechanisms. What the foregoing sonoporation mechanisms have in common is that they require the presence of a microbubble or a cell, or both. However, ultrasound is known to facilitate leakage from phospholipid vesicles, which are not cells and contain no proteins, in the absence of microbubbles. [98, 99] Sonoporation of phospholipid vesicles (or liposomes) shows us that the putative sonoporation mechanisms of Figure 9 do not tell the whole story, but this fact has gone largely ignored or unnoticed. The observation is important because in addition to delivery of cargo into a cell, one can now envision ultrasound-triggered release of cargo from a vesicle, or “reverse sonoporation.” We therefore propose additional mechanisms in Figure 10 to account for reverse sonoporation of liposomes. First is nucleation of a gas bubble within the vesicle bilayer (Fig. 10D), whereby subsequent growth, expansion, and/or translocation of this bubble creates the pore for sonoporation. This idea is not new. Such intra-membrane nucleation has been previously suggested by Schroeder et al.. A related idea, similar to that in panel 10D, is that ultrasound can tear apart bilayer leaflets, thus creating what Krasovitski et al. refer to as a “bilayer sonophore” or BLS. While formation of a BLS would not require the presence of a microbubble, it would require - as conceded by Krasovitski et al. - the presence of cellular proteins; accordingly, the theory introduced by Krasovitski et al. is not sufficient to explain sonoporation of protein-free liposomes. Also not new is that ultrasound can catastrophically disrupt a phospholipid vesicle (Fig. 10E); indeed, this is believed to be a primary means by which ultrasound generates small, uni-lamellar vesicles from multi-lamellar vesicles and has been shown to contribute - at least in part - to ultrasound-induced leakage from liposomes. There is a new idea we wish to present, which to our knowledge has not been previously discussed. That is, we believe that in the presence of ultrasound it is possible - perhaps even probable - to nucleate dissolved gases (e.g., oxygen, carbon dioxide, nitrogen, etc.) or vaporize water itself within the aqueous core of a vesicle. Expansion of the gas or vapor then dilates the system, leading to greater separation between phospholipid molecules than in the resting state; this is shown in Fig. 10F. Such dilation, which could, strictly speaking, arise even in the absence of formation of a gas or vapor pocket within the aqueous core, would permit diffusion across the bilayer during negative portions of the ultrasound wave. While not involving pores per se, this mechanism would account for the transport observed in microbubble-free, protein-free, cell-free liposome systems. Moreover, for the case of nesting microbubbles inside the aqueous core of liposomes, dilation (Fig. 10F) could be an additional mechanism (in addition to those of Fig. 9) by which microbubbles facilitate transport across an otherwise impermeable bilayer. There is second, new mechanism we wish to propose. Specifically, one could imagine a hybrid model involving microbubbles and intra-membrane cavitation. That is, a microbubble could fuse with a phospholipid bilayer, be that bilayer a cell membrane or a vesicle bilayer, in a fashion analogous to vesicle-vesicle membrane fusion. [101, 102] The result, shown as Figure 11, would be a bilayer that contains a gas pocket similar to the nucleated gas envisioned by Schroeder et al. (10D) or the BLS envisioned by Krasovitski et al. Although the end result is the same, this mechanism (Fig. 11G) would require no nucleation of gas and no tearing apart of leaflets between proteins. Figure 11 is not the only possible combination of microbubbles and liposomes. We previously described covalently linking microbubbles to the outer monolayer of liposomes and nesting of microbubbles inside the aqueous core  as means to facilitate ultrasound-induced leakage of drugs. We refer to ultrasound-induced drug release from vesicles as reverse sonoporation. An advantage of liposomes for drug release is that the kinetics of release are tunable with vesicle size and bilayer phase behavior. It is also possible that the mechanism of (reverse) sonoporation varies with phase. We recently reported that liquid-ordered bilayers show no evidence of destruction, whereas liquid- disordered bilayers exhibit partial destruction. Enden et al. also found that destruction contributes partially to observed ultrasound-induced leakage from vesicles. We now take a closer look at those findings and consider results from a reverse sonoporation study in a lipid system with well-defined phase behavior. The liposomal bilayers comprised a ternary mixture of 1,2-dioleoyl-phosphocholine (DOPC), 1,2-dipalmitoyl-phosphocholine (DPPC), and cholesterol. The primary utility of this particular lipid mixture is that it has a two-phase region, in which liquid-ordered domains, or rafts, coexist with a liquid-disordered phase, and has been well characterized. [103-108] Release was measured via monitoring of the de-quenching of calcein with steady-state fluorescence spectroscopy, as described previously. As shown in Figure 12a, the diffusion model fits the experimental data well, without accounting for any liposome destruction. However, a similarly good fit can be obtained by a model that accounts only for liposome destruction. Specifically, solid lines in Figure 13b are best fits of a destruction model in which the rate of liposome destruction is proportional to the first order of liposome concentration such that the number of remaining liposomes decreases exponentially with time. Thus, release data alone cannot distinguish between the contributions of diffusion (Fig. 12a) and liposome destruction (Fig. 12b). where φB is the fraction of surface area occupied by pores, and b is a pore radius. This expression would then need to be modified to account for the transient nature of the pores. 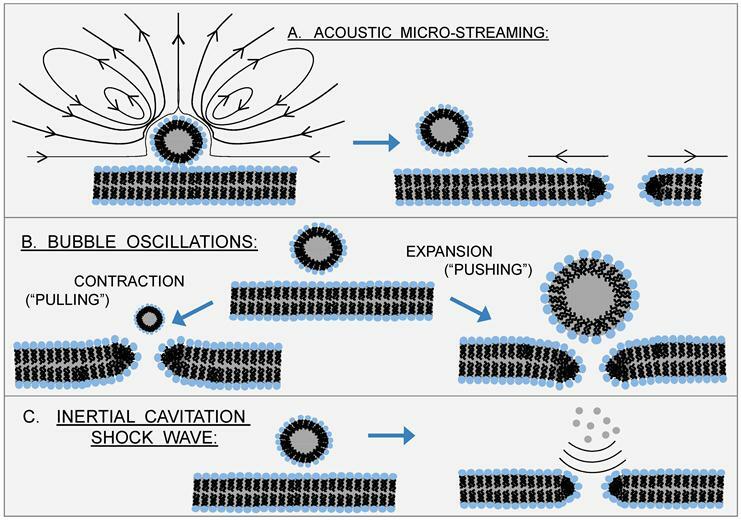 Putative Sonoporation Mechanisms Involving Microbubbles: Sonoporation traditionally involves exogenous microbubbles in close proximity to cells, and the mechanism of action by which ultrasound forms transient pores in the cell membrane is believed to stem from various microbubble phenomena: A) acoustic streaming associated with stable cavitation; B) bubble/cell membrane interactions arising from bubble oscillations; and C) shock waves generated by inertial cavitation. In each case, the net result is a disruption (or pore) in the cell membrane and reorientation of phospholipids in the vicinity of the pore to prevent exposure of acyl chains. Re-drawn from Delalande 2011. Reverse Sonoporation Mechanisms: Sonoporation traditionally involves microbubbles in close proximity to cells. However, sonoporation is also known to occur with liposomes. With the exception of nesting microbubbles inside the aqueous core of phospholipid vesicles, the putative mechanisms of Figure 9 are not applicable here; another mechanism or mechanisms must account for ultrasound-induced leakage from liposomes. One possibility is nucleation of a gas bubble in the hydrophobic region of the phospholipid bilayer; subsequent growth, expansion, and/or translocation of this bubble creates the pore for transport (D). 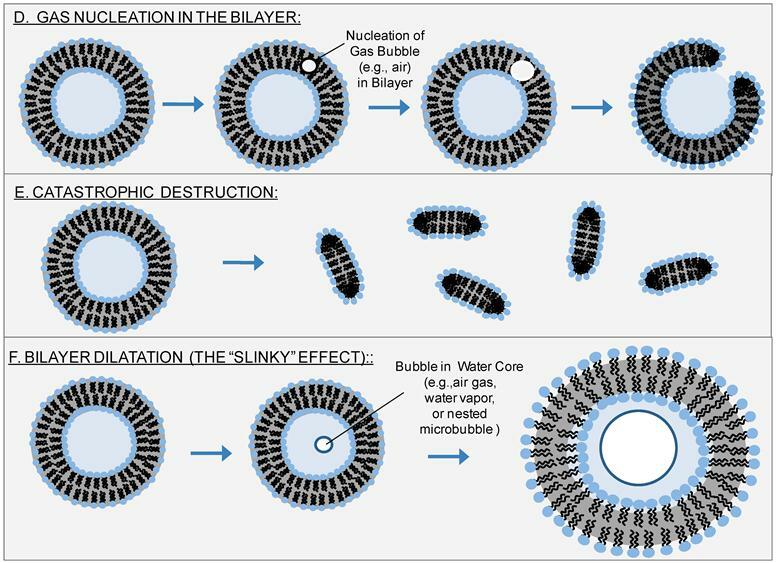 Another possibility is that inertial cavitation of bubbles (generated either inside the liposome core, within the liposomal bilayer, or in the bulk aqueous phase) catastrophically disrupts the liposome (indeed, this is believed to be the mechanism by which sonication creates small, uni-lamellar vesicles from giant, multi-lamellar vesicles) (E). Lastly, we propose a new mechanism, which recognizes that negative ultrasound pressure causes the entire liposome to expand, leading to dilation and increased separation between phospholipids (F). Such dilation would be enhanced by formation of a bubble - e.g., via nucleation of dissolved gases or vaporization of water - (or by nesting of one or more microbubbles) inside the aqueous core of the liposome and subsequent expansion of this bubble with negative ultrasound pressure. Although mechanism (F) would not create holes per se, it would account for the increased membrane permeability observed upon application of ultrasound. A Hybrid Model - Fusion of a Microbubble with a Bilayer: We combine the notion that sonoporation traditionally involves microbubbles with the intra-membrane gas nucleation mechanism (Fig. 10D) described by Schroeder et al. 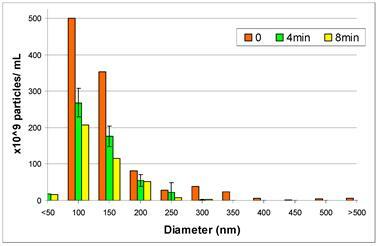 Results from a Nanosight LM10-HS Study of Liposome Number and Size Distribution Under Applied Ultrasound: The sample corresponds to the liquid-disordered sample of Figure 12. Time refers to ultrasound (20 kHz, continuous wave) exposure time, where 0 denotes the initial distribution. The overall reduction in the size distribution, which indicates a loss of particles, is evidence of ultrasound-induced vesicle destruction and is consistent with mechanism (E) in Figure 10. Phospholipid monolayer-coated microbubbles and phospholipid bilayer vesicles are attractive candidates for “theranostic” applications because of their tunability with membrane composition and the sensitivity of acoustic phenomena to the resulting membrane properties. 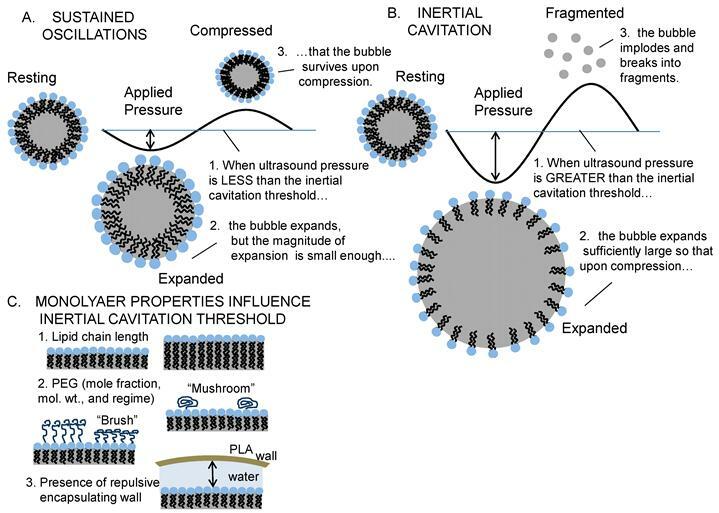 This paper has given specific, quantitative examples of how membrane properties influence inertial cavitation of microbubbles and how membrane phase behavior influences kinetics and mechanisms of sonoporation of liposomes. Such information will potentially be useful in guiding rational design and optimization of theranostic applications and technologies that involve combinations of ultrasound, microbubbles, and liposomes. Corresponding author: Tel: 215.895.6694; Fax: 215.895.5837; Email: spw22edu.